Uuuuggghhh….Who else woke up a bit groggy & headachy this morning? I certainly did. Too much indulgence & Vegan Vine Wine. It was worth it at the time, but I needed a nourishing breakfast to get my lazy morning started on the right foot! 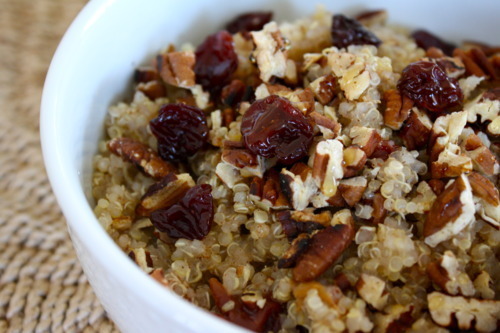 "Quinoa Breakfast Bowl with Tart Cherries & Toasted Pecans"
Combine almond milk, water & quinoa in a medium saucepan. Bring to a boil over high heat. Reduce heat to medium-low; cover & simmer 15 minutes or until most of the liquid is absorbed. Turn off heat; let stand covered 5 minutes. Stir in cherries & cinnamon; transfer to 2 bowls & top with pecans. Drizzle agave nectar over each serving. Serves 2.